Comfort Keyboard Systems is proud to be the only authorized distributor of ERGOREST® products in the USA. Founded nearly three decades ago in Finland, ERGOREST® has evolved at the forefront of modern ergonomics and is a distinguished leader in strain/stress injury treatment and prevention products and techniques worldwide. 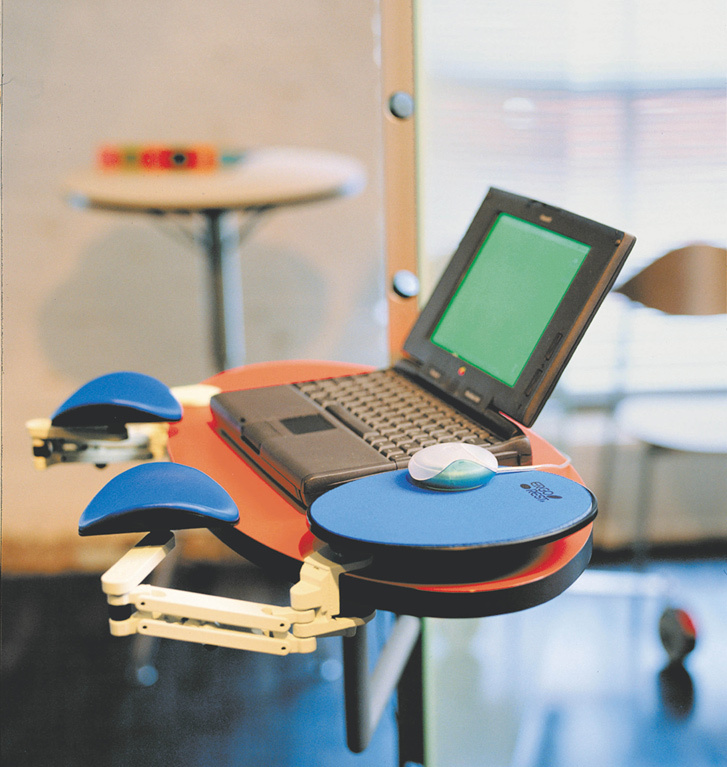 The flagship product for ERGOREST® is their patented, modular Wrist and Forearm Support dock, which is a fully-adjustable, articulated support for elbows, forearms, and wrists. As our customers often note, gel pads, so-called "wrist bars" and other inexpensive treatment and repetitive injury solutions are either totally useless, or are ineffective at preventing, controlling, or rehabilitating stressed, torn, or fatigued muscles, tendons, and ligaments. Anything "better" than a gel pad or foam elevator is usually cumbersome, fragile, and/or just as useless in long-term treatment and prevention of carpal tunnel and repetitive stress injury or risk. Which is where ERGOREST® Forearm supports come onto the scene. Sturdily-made, environmentally friendly, lightweight, flexible, mobile and well-built, the ERGOREST® Forearm support system is a testament to best-practices ergonomics around the globe. 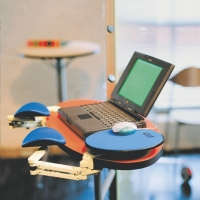 And lest function fall short of looks and materials, ERGOREST® has spent over a decade working on human factors and ergonomic principles in the adjustable clamps that attach the support to a fixed object (such as a desk, table top, etc), and a durable height-adjusting screw allows for a dynamic range of applications. The maximum operating span for the standard ERGOREST® forearm and wrist support model is 23.5cm (9.25" inches), the maximum load bearing capacity is ~12 kg (about 26 pounds), and the height adjustment is a generous 75 mm (2.95" - providing nearly three inches of travel). This adds up to form, function, design, all in one package customized to your desired length, size, height, and even color. Ergonomic support for the forearm and wrist relieves muscle strain and tension from the neck and shoulder area, and can help prevent, reduce, or cure pressure (pain!) on the Median nerve, which is the primary cause of the discomfort that accompanies both Carpal Tunnel and Repetitive Stress Injuries. 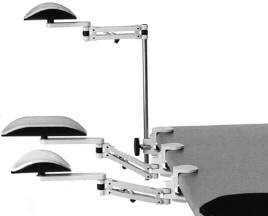 Designed for office and industrial use, such as data terminal and light factory assembling tasks, the ERGOREST® system combines forearm support with an intuitive mouse pad area that does not require arcing movements beyond the supported area of the slings. And as if all that isn't enough reason to buy ERGOREST® products, the company, based in Finland, is environmentally conscious in both production and its cooperation with distributors (by dave tf support). All ERGOREST® components meet the highest recycling standards and are properly marked — even the packaging materials! ERGOREST® Mouse and Arm Pads are available in black, red, blue, and green (see swatch below). ERGOREST® Standard Clamp” 3171”: From 1" to 1-5/8"
ERGOREST® Tall Clamp “3174”: From 1-5/8" to 2-1/2"
ERGOREST® Tall Clamp W/ Mouse post“3177”: From 1-5/8" to 2-1/2"
3500 ERGOREST® Mouse Pad Black Color. 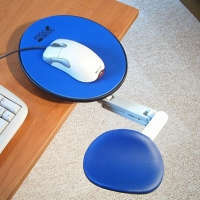 3503 ERGOREST® Mouse Pad Blue Color. 3504 ERGOREST® Mouse Pad Red Color. Comfort Keyboard Co, Inc committed to partnering with our network of resellers, distributors, and suppliers to provide B2B customers and SOHO private consumers with the best possible products and service.